Borrowing liberally from the French film La Totale, this is an action picture, domestic comedy, and political thriller rolled into a crowd-pleasing ball of entertainment. Producer James Cameron wrote and directed the film. 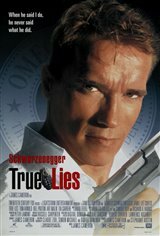 Henry Tasker (Arnold Schwarzenegger) is a workaholic computer salesman neglecting his mousy wife Helen (Jamie Lee Curtis), a legal secretary. Simon (Bill Paxton) seduces Helen with the lie that he is a secret agent; he's really a used car salesman. Harry suspects that Helen is cheating on him, and he sends a few colleagues to kidnap them. Helen then discovers that Harry is a secret agent by night, working for a shadowy group called the Omega Sector. Harry and his partner Gib (Tom Arnold) are trying to find four nuclear warheads that have disappeared from a former Soviet republic.